Published Jul 3, 2014 by Cisco Press. Part of the LiveLessons series. 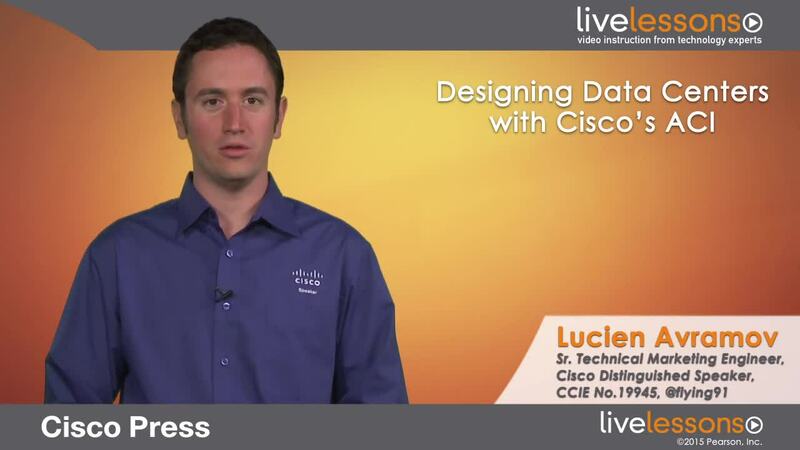 Designing Data Centers with Cisco's Application Centric Infrastructure (ACI) LiveLessons Networking Talk helps you understand how to build effective data center network designs with Cisco's Application Centric Infrastructure (ACI). Lucien Avramov, CCIE and data center expert at Cisco, starts by explaining key considerations to have when building a data center design. Lucien then goes on to explain data center switch architectures and presents a new way to look at data centers using the policy model. The video concludes by introducing ACI network fabrics and showing you how ACI fits into the OpenStack solution and demonstrating how the integration is done. The target audience for this video is the network architect or network engineer.¿ The secondary audience would be help desk analysts or network administrators as well as storage administrators looking for information regarding storage implications. The third audience is application, IT and software programmer engineers or architect, to understand the networking and how to utilize at best a data center fabric. Lucien Avramov, CCIE No. 19945 (Routing and Switching) is a Technical Marketing Engineer (TME) at Cisco, in the Data Center Group where he supports the Cisco Nexus 6000,5000, 3000, 2000 and 1000v Series products. He has 7 years of network experience at Cisco. Lucien is focused on Data Center Architecture and Designs working with customers to help them face the constant evolution of technical and business challenges around providing the best possible end-to-end solutions. Lucien has a strong technical background and has remained a hands on internetwork expert. He was previously a customer support engineer and Technical Leader in the Cisco Technical Assistance Center. He holds a bachelor's degree in general engineering and a master's degree in computer science from Ecole des Mines d'Ales as well as the following certifications: CCIE #19945, CCDP, DCNIS, and VCP #66183. The target audience for this video is the network architect or network engineer. The secondary audience would be help desk analysts or network administrators as well as storage administrators looking for information regarding storage implications. The third audience is application, IT and software programmer engineers or architect, to understand the networking and how to utilize at best a data center fabric.